Home / Blog / Pollen Patties – Are They Necessary? Pollen Patties – Are They Necessary? A bee colony by nature is self-sufficient. Bees have survived many generations in the wild (and still do) long before humans discovered their value. They have learned to prepare for all seasons and that is the reason honey is stored in the combs. This honey is set aside for consumption and survival of the bee colony. However, as a result of man’s interference, it is difficult for a bee colony to rely on their honey stores since we harvest the honey that has been kept aside. Intensively managed hives in particularly have a dire need for feed supplements, more so, in areas where monoculture is common. The honey stores may not sustain the bee colony in such an area and it is also not possible to get a good quality at all times of the year. This may result in weak colonies that cannot compete and are prone to a greater risk of dying out. In such a case, pollen patties are indispensable for the survival of the bee colony and should be provided at the right quantity, location, and time. Can a Bee Hive Survive Without Food Supplements? Pollen Patty on top of a hive. Pollen patties are a bee food that are used to boost brood production. Pollen patties are made from a mixture of ingredients that actually contain no pollen but is formulated to stimulate real pollen. Some of the ingredients in pollen patties may include: vitamins, lemon juice, yeast, pollen, sugar, dried egg, honey, and oil. They are available in local stores as well as online as ready for use and can also be formulated at home using a purchased mix. You can also make your own pollen patties using a variety of recipes. 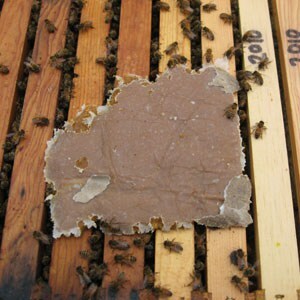 Pollen patties have a stiff and thick texture and are formulated to be placed on top of the frames in the hive. This substance is used for feeding the larvae since all other life stages of the bee do not consume pollen. For instance, the pupa and egg do not eat at all and the adult bees feed on honey. The larvae require highly nutritious protein food usually found in pollen. The pollen is ingested by the adult bee then converted to royal jelly used for feeding the larvae. The diet changes as the larvae mature and will vary depending on whether it becomes the queen, drone, or worker bee. Most bee hives can get along without the provision of food supplements. However, such a hive may fail to thrive. A hive that has a low supply of honey or pollen will drastically stop brood rearing and those with half-grown brood will destroy the entire brood. The larvae that makes it through this period will be malnourished and at adulthood will be a weak nurse or forager bee. The effect of a short period of food shortage may not be felt immediately but will linger over a long period, even for generations. We learn by inductive experience that is easier to identify honey shortage in a hive than it is to note protein shortage. Almost all parts of the United States share a common problem, a shortage of wild or uncultivated land and this translates to a decline in the variety of natural forage. This is precisely why it is necessary to feed the bees with protein supplements especially in spring and fall. Pollen may be abundant at this time but it may all be sourced from a single variety of forage. This may have a few or lack the nutrients required by the bees. The supply of a balanced nutrition to bees in the recent past has been taken more seriously, since adult bees and the brood have become a victim of mite invasions. Pollen patties guarantee a balanced diet and hence healthy brood and adult bees that can better withstand mites and other environmental challenges. Most beekeepers know when and how to provide carbohydrate supplements to the bees but few understand protein supplementation. Sugar syrup and honey are the main sources of carbohydrates for bees. These are easily available and are easy to feed. Protein supplements on the other hand require careful positioning and proper timing. Remember, pollen patties accelerate brood rearing which if not well managed can result in starvation, an over-populated hive, or swarming at onset of spring. 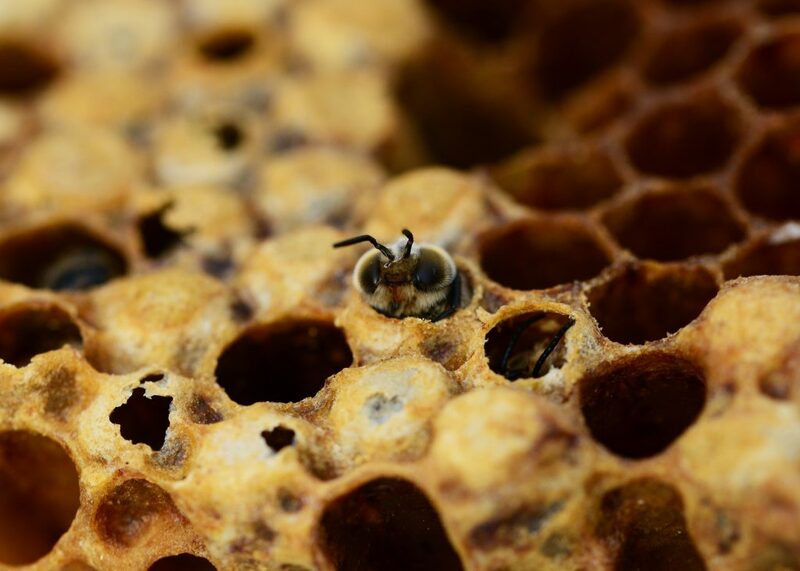 Pollen accelerates brood production. The availability of a rich diet to the nurse bees ensures an abundant supply of royal jelly. Cells are built fast and the queen begins laying eggs which ultimately translates to mass brood production. It is a time for the queen to rejuvenate and take a break from egg laying. It helps conserve the food stores since a lack of brood means lower temperatures within the cluster. High temperatures stimulate bees to eat honey. A smaller brood is required in order to keep the hive population low. This helps guarantee a secure supply of food over the hard seasons. The varroa cycle is broken when brood rearing is ended. The survival of the varroa mite depends of the presence of brood. It therefore proves wise for every beekeeper to consider pollen patties at the right time. Maintain a manageable colony size over winter and substitute the protein at the end of the season. In nature, bees follow the changes in the season. The end of winter marks the beginning of brood production. Do not supply patty too many days before natural pollen becomes abundant. It is also important to ensure additional patties are provided before previous patties run dry. This will help prevent bees from tearing already initiated brood. The bees should be provided with attractive and continuous supply of pollen patties so as to prevent hive collapse or decline. In most cases, a hive collapse is never immediate. As a matter of fact, it can occur some weeks later and surprise even the most knowledgeable beekeeper. If you choose to feed the bees with only one patty, then consider a low protein supplement. This will not stimulate the bees prematurely. On the flipside, if you choose to feed bees pollen patties, then ensure a continuous supply is provided until natural pollen is available. Bees will benefit from protein feeding at any time of the year. However, they are best fed with pollen patties in spring. As mentioned prior, the main purpose of pollen patties is to stimulate brood rearing but to do this earlier than required can impact the bee colony negatively. Another factor worth considering before feeding bees with pollen patties is the nature of your business. Not every beekeeper has to feed their bees with pollen patties. An attempt to stimulate brood production earlier on means the beekeeper has to provide more sugar syrup to a rapid bee population within a short period of time. It therefore goes without saying that pollen patties will serve well those who plan to increase their hives or queens. Those who rent hives for pollination will also benefit immensely from the use of brood patties. A weak bee colony will also require some boost and the supplements are the solution to that. The pollen patties should be well positioned within the hive otherwise the bees can easily ignore it. Ideally it should be placed on the top of the frames just under the inner cover. You can even place it directly on the bees. In most cases, any patty placed further away towards the corners of the hive remain untouched. One of the advantages associated with pollen patties and any substance in patty form, is that they easily slip under the inner cover. You do not have to tear apart the top of the hive in order to do this. You can place the patties on top bars on the upper part of the hive. Ensure it is placed at the center where it is easily accessed by the cluster. It is also important to understand the amount of pollen patties needed. It does not take much brain work to know the amount of pollen substitute needed for your bee colony. As a general rule, a kilogram of pollen patties will feed one kilogram of bees which can be about 9,000 to 10,000 bees. Once bees get their supply of pollen patties, this should continue until sufficient amount of natural pollen is available. If you are an organic gardener or simply prefer to purchase organic food, then you should engage in organic beekeeping as well. Organic pollen patties are preferred by many since it is safe and more beneficial to the bees. Organic beekeeping is simply a practice that adheres to organic practices. The standards set for organic beekeeping will vary from country to country but they are all focused on practices that minimize the use of chemicals and focus on use of natural materials. Use bee hives made using natural materials. Hives may be built using materials such as plastic, polystyrene, wood and many others. Wooden hives are preferred in organic beekeeping. Controlling pests and mites without use of chemicals. For instance, some beekeepers recommend the use of lemon juice for controlling varroa mites. Feeding should also be well regulated. For instance, if bees require sugar syrup then organic sugar may only be given. Strategically positioning the hives in organic land far from areas with potential chemical contamination. The recommended radius on organic land varies depending on the region. Feeding the bees on their own honey is an organic way of keeping bees. The honey reserves are not completely harvested from the hives so that the bees can feed on it. 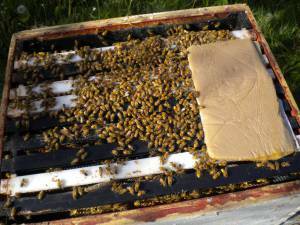 The comb and beeswax foundation used should be made from organic beeswax. As for organic pollen patties, it would be wise to ensure the ingredients that make up the patties were sourced from manufacturers who use organic farming methods. If you decide to make your own pollen patties at home, then source your ingredients from products you have produced organically. You can also get them from organic gardeners or farmers. The best source of natural pollen is pollen-bearing plants. In case there is a shortage of pollen in the hive, then feed the bees with pollen patties, pollen substitute or pollen kept aside during the previous season. Pollen should only be collected from strong bee colonies that are free from diseases. An ideal pollen trap should be set in the hive for a desirable period of time and not for too long such that it depletes the available pollen from the colony. Pollen patties should be kept in a cool and dry place. You do not have to refrigerate it but you can freeze and keep it for later use. The pollen in patties may be an attractant and greatly boosts bee nutrition; however, the quality of pollen collected will vary depending on the forage available, dryness and storage. The nutritional value of pollen diminishes when it dries and when it is kept for a long time. In fact, pollen patties that have been frozen and stored for more than 3 years are practically worthless. The proper way to keep and store pollen patties is by freezing without drying after it is collected. It should only be stored over one winter and then irradiated into consumable patties. The ready for use pollen patties from Mann Lake are specially formulated for the honeybee. It is available in a 10 pound package with each of the patty weighing approximately 1 pound. This substance can be mixed with Pro Health, which is a digestive health aide that helps encourage bees to consume patties and feeds with medication. The Mann Lake Pollen patties are not only rich in nutritional value but it also facilitates a faster consumption in bees. It improves the overall brood production and results in better performing hives. It is ready for use and does not require any special mixing. It is available in a 10-pound size packaging with each patty weighing approximately 1 pound. The package has dimensions of 12-1/4 inches length x 10-1/2 inches in width x 3 inches in height. No need to worry about mixing. Blends well with Pro Health – one of the health aide that helps stimulate bees to feed on pollen patties and other medicated feeds. It is used by those who want to encourage faster consumption and enjoy maximum nutritional value. 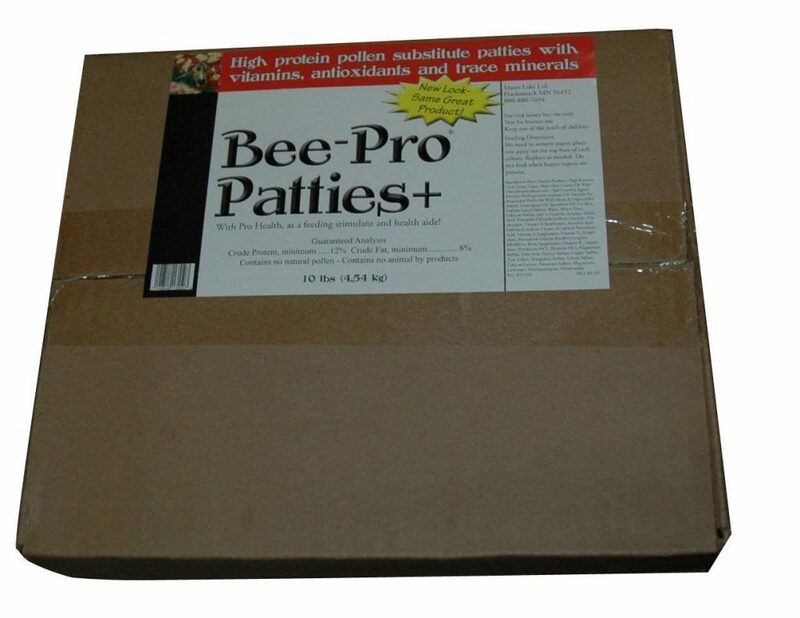 These patties have been tested and proven to be effective in brood production. It helps kick-start an early brood production in hives. Controlled hives experienced an increase in brood production from 1 and half to 3 frames overall. It is able to rapidly increase bee populations. It can be fed on bees on all seasons since it is not dependent on weather. Easy to use. Take it out from the box and place it in the hive. Does not require special mixing. No mess to worry about. Proven to improve brood production which results in increased hive population. Enhances the health of the bee colony. Ideal for weak bee colonies. It does not depend on weather. You can use it anytime and in any season. Can be stored for future use. You can freeze and store it for later use. Its usage should be controlled otherwise it may lead to unmanageable bee populations. 8 cups of brewer’s yeast. Water, at least 3 cups. Take the pollen and put it in the large bowl. Add 1 and half cups of water and mix thoroughly. Ensure the pollen is completely dissolved. Take 1 and half cups of water that remain and boil it. Add the sugar and stir the mixture until it is completely dissolved. Take the mixture out of the heater or stove and let it cool so that it transforms into thick syrup. Take the sugar syrup and add it to the pollen mixture. Mix this well. Take brewer’s yeast and add it to the mixture of pollen and sugar syrup. Stir it thoroughly. If the mixture is too stiff for the spoon, then you can use the paint paddle to stir. Take the mixture into a large piece of wax paper and use a rolling pin to flatten it. Smear the rolling pin with the white flour so that the mixture does not stick to the pin. Prepare a number of large patties. This mixture with the given amounts can make up to 8 patties. The wax paper helps retain the moisture in the patties. You should however ensure that the outer part of the wax paper does not get sticky so that the patties do not stick together. You can place these patties in the hives or simply refrigerate them until later use. Honeybees are fed on two classes of protein supplements. These include: pollen supplements and pollen substitutes. The pollen supplements are artificial pollen that are rich in protein whereas the pollen substitutes contain no pollen but are rich in protein. Pollen patties can only supplement bee food but they should never be a replacement for natural pollen. They bees should only be supplied with the supplements when there is a need to do so. For instance, the end of winter marks the beginning of brood production in bees and this should be a good time to supply them pollen patties. The feeding should continue until natural sources of pollen and nectar are sufficient for the bees. The best protein supplement should be easy to consume and should contain the right quality and quantity of ingredients for the bees. These include: proteins, minerals, and lipids. The right blend of ingredients is required for growth and development of the colony. Some of the ingredients that make excellent pollen patties include soybean flour, brewer’s yeast, sugar, and honey. A combination of these can make a good protein supplement for the bees. It is also important to note that different regions have their unique challenges not to mention the colony itself. A colony in warmer winter regions is prone to more bee activity which means more honey is consumed and this can lead to starvation. Extreme cold can also freeze the bees and cause a colony to be wiped out. With that in mind, it is wise to treat each individual hive uniquely and act accordingly whenever a challenge comes up. Pollen patties can be essential for the survival of the bee colony. It is not necessarily required by every beekeeper. Regions that have abundant supply of pollen during fall never suffer from a lack of pollen later on since the bees can store enough pollen for the hard seasons. These pollen reserves are sufficient for the colony until spring when sources of nectar and pollen are aplenty. Pollen patties should only be used when the intention is to raise early season splits or those who want to raise their own queens. Weak colonies can also be strengthened by feeding bees with pollen patties. Furthermore, those who engage in the business of renting out their beehives for pollination can build colonies faster by feeding the bees with pollen patties. Do you use pollen patties? What do you think of them? Leave a comment below and let us know.